Page 40 of 41 for Digital Forensic Science | Tutorials and research about digital forensic science and information security. Logo design by Laura Small and Joshua James. Digital artwork by Laura Small. The REAPER logo by Joshua James is licensed under a Creative Commons Attribution-Noncommercial-Share Alike 3.0 License. Based on a work at CybercrimeTech.com. Permissions beyond the scope of this license may be available at https://DFIR.Science. The non-branded Debian logo is released by the Debian group under the Copyright (c) 1999 Software in the Public Interest. Details can be found here. After completing pt.1 and pt.2 BIND, Apache and some permissions still need to be set before everything will work all hunky-dory. Save ‘loc.hosts’, and restart bind for good measure. Try: ‘ping monkey.ocfa.oc’ - if you get a reply then DNS is working. Now to create a case you must log in as the newly created ocfa user. If you are use ‘su’ to switch to ocfa, make sure you use the ‘su - ocfa’ switch to load environment variables. You will be prompted for a case name. Just to test lets use ‘test’. The case should not have been created already, and you will get a message telling you to run ‘createcase.pl’. Attempt to run this by typing ‘createcase.pl test ocfa’. Set permissions to 755 for the bin directory. *If you are still getting a permission denied, make sure you are changing permissions on the files, and not on the directory itself. You should get a page displaying the case name. If you get a ‘500 - Internal Server Error’ message, ensure the directories listed above are set to ‘755’. If permissions are correct, check ‘/var/log/apache2/error.log’. In cases such as this, it was usually a perl module that needed to be installed. Verify that you did install the ‘libpg-perl libxml-dom-perl’ packages. If so try searching google and the apt repositories for the cause of the error; ‘Pg.pm’ in this case. If you were successful you should be able to access OCFA from a browser to view added evidence. Please see singles labeled ‘OCFAHowTo’ for instructions on using the Open Computer Forensic Architecture to analyze evidence. This single will cover creating a temporary file share on your Samba server to easily share packages. This tutorial is geared towards OCFA on Debian users, but is a general Samba share configuration. The only assumption is that you have a working Samba installation. chmod 777 ocfaShareNote 777 is dangerous if you are not on a trusted network. Make sure you apply permissions appropriate to your situation. Click here for a tutorial on setting Linux file permissions. = “”Where username is the name of the user you specified in the ‘valid users’ section. Then save, and exit. /etc/init.d/samba restartType ‘ifconfig’ to get the IP address of the local computer (usually eth0). Using this IP address you should be able to access the share. On a Windows computer, go to ‘start’ and ‘run’ then type ‘\x.x.x.x/ocfaShare/’ where x is your ip address. In both cases you will be asked to log in. Use the username and password you specified earlier. Just remove the line in smb.conf starting with [ocfaShare] to remove the shared folder when done. Now that we have a working Debian install, we can get it ready for OCFA. After pt.1 we have a basic Debian install with a File (samba) and DNS (BIND) services. This make sure 1) you get the newest software versions from apt, and 2) you don’t need mess with the install CD anymore. The following packages are said to be required in the install documentation. Debian 5.0 has several packages that are different. Use can also use ‘ more’ or ‘ grep (searchString)’ if there are a lot of hits in the cache. After installing a library run ‘ldconfig’ to make sure the loader can find your libraries. The both install by just typing ‘make’ in their directory. Now it is finally time to start installing OCFA! Are you excited? I know I am. You should not receive any errors, and all items in the list should be ‘found’. If there are no errors, run ‘make install’. If there are errors attempt to find the package that is associated with the error using the apt-cache search method described above. If you are really really really stuck, try the OCFA Mailing List. While its building you should get some tea. mmMMmm. Eventually it will finish (hopefully with no errors). You can navigate directly to OCFAArch and start building it. Again in OcfaArch run ‘./configure’ - it should ‘find’ everything. If not look for the packages before continuing. Once OcfaArch has been built it will ask to reconfigure the database - say yes. A user ‘ocfa’ is created. I allow the ocfa user to create new roles. yes - Allow the script to overwrite the apache config. Choose (t)est or (p)roduction server. Now you have a working OcfaArch, which you can test - by following the instructions in ‘ocfa/doc/usage/install/HOWTO-INSTALL-TEST.txt’ HOWEVER, when accessing the interface you will receive the web error: 500 because permissions are not set correctly. <blockquote>(part. 1)Since we have installed testdisk using apt, navigate to ‘/usr/local/sbin/’. If you have an executable called ‘photorec’, skip to (part 3). If you do not see photorec in sbin go to (part 2). (part 2) Building photorec from source. Download photorec/testdisk - Project Page. I am using testdisk 6.11-WIP. <ul><li>Extract the contents to your OCFA server and navigate to /testdisk-(versionNum)/</li><li>Run the command ‘./configure –without-ncurses’</li><li>Then the normal ‘make’ and ‘make install’</li><li>Navigate back to ‘/usr/local/sbin’ and check for the existence of ‘photorec’</li><li>If it is there continue to (part 3), if not attempt to build again.</li></ul>(part 3) Create a symbolic link from photorec - In version 2.1.1 OCFA searches for ‘photorec_cli’ rather than just ‘photorec’ in sbin. In OCFA 2.2.0 I received an error about a Transport::Dmx perl module. There is not a Debian package for it, so you need to install in manually. It can be downloaded from here http://search.cpan.org/~vparseval/Mail-Transport-Dbx-0.07/Dbx.pm. To install extract, navigate into the created directory, run ‘perl Makefile.pl’, make, make install. That should be it. I also received an error about my java version telling me I would not be able to run jlucene. To fix this, edit the ‘configure’ file for OcfaModules, and in the function ‘javaok’ change the ‘javac test.java’ line to ‘javac -source 5.0 test.java’. On all the installs I have tried I receive an error dealing with ‘Lucene’. Also make sure you have ‘ant’ installed in lenny. Run ‘./configure’ again, then ‘make’. If it completes without error, you have a mostly-working OCFA install with Modules. Now before you go on to test you need to create the hash sets. The installation document for the Open Computer Forensic Architecture was mostly accurate. However, I ran into some issues. Posts labeled OCFAInstall are supplements to the OCFA on Debian installation documentation which can be found (once OCFA is downloaded) in ‘ocfa/doc/usage/install/HOWTO-INSTALL-debian-etch.txt’ - Direct download links, a bit more detail in some areas, as well as some troubleshooting advice to issues I ran into is given. At the time of this writing OCFA 2.1.1 is the current version. Get Debian 5.0 (lenny) Tested on Feb. 19, 2009 to work with OCFA. As suggested by the OCFA installation instructions, I am using the newInstall version of Debian. The target machine must be able to connect to the internet to download required packages. If this is not an option you can download the larger Debian install CD/DVD (650MB - 4.4 GB), however they may not contain all required packages. In that case you will need a way to download and transfer the packages to the target machine. The suggested hardware is at least a 40GB internal disk, and some sort of SAN or RAID system with 1+TB of storage, and at least 2GB of memory. That being said, these are recommendations for production servers. I am testing, and know I will not be processing real-world amounts of data. Because of this I can say that, for me, a virtual machine with a total of 40GB storage, and 2GB of memory has worked very well for my purposes. *The VM was originally assigned 512MB of memory, which was much too little and eventually caused errors. 1) To avoid future confusion, don’t name your machine simply ‘OCFA’. Try ‘OCFAServer’ or the name of a greek god. 2) Do not create a user named ‘OCFA’ - one will be created automatically later. Scroll down and find your disk - mine is IDE1 master (hda) - you may have more than one. If so start with the disk you want to install the operating system on. In my case, there are no partitions. When you select the device, you will be asked if you want to partition the entire device. Say yes. This produces a primary partition equal to the size of the device. Now scroll to ‘Use as’ and hit enter: This is where you set the file system (xfs, ext3, swap). Scroll down and choose ‘swap area’. Once done, scroll down to ‘Done setting up the partition’ and hit enter. The final result should look similar to the following screen shot. Due to a small drive, I do not have a separate partition for /var/log. 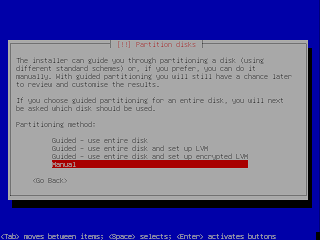 e ‘write changes to disk’, and your partitions are done. <div style="text-align: left;">In the Software selection section I chose ‘DNS Server, File Server and Standard System’ - I don’t think there is really a need for a Desktop environment, unless you are using this as a workstation as well. After the installation of GRUB the system will reboot, and you should have a working Debian install ready for OCFA.